Dr. Xiaoxiao Wang graduated from the University of Sydney with a degree in the Doctor of Dental Medicine (DMD) attaining a level of excellence in general dentistry. She has a wide range of experience in public hospitals and private clinics, working in both urban and remote practices. Dr. Wang has since established her own dental clinic 360° Dental Care, continuing with her professional development as she furthers her education in implant and advanced oral surgery. 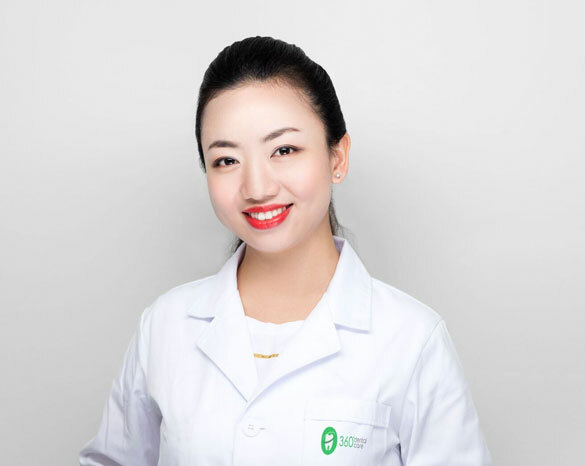 Xiaoxiao is a motivated professional, her interests exhibited in mastering advancements in dental technology and oral health. Her calm and caring nature places patients at ease, as she pays attentive detail to every patient she treats. This conscientious attention to detail allows accurate diagnosis and in-depth treatment plans for her patients giving them the best possible outcomes. She has a particular interest in implants, orthodontic, paediatric and cosmetic dentistry, and enjoys travelling, cooking, and trying new adventurous things. Dr. Wang keeps her dental knowledge updated by continuing with ongoing education courses. She is also an active member of the Australian Dental Association (ADA), the International Association of Dental Traumatology (IADT), and the International Association for Orthodontics (IOA). With this positive mindset, Dr. Wang strives for excellence in providing comprehensive dental care for you and your family. Meet our principle dentist Dr. Wang today at 360° Dental Care.